Political science is a discipline that deals with the composition and function of the country’s government. The term political science is often contrasted with politics which is concerned with the activities of country’s governance, with the aim of achieving and using power or authority. Another crucial difference between political science and politics is that Political Science is all about politics that take place in a country. Conversely, in politics there exist various political groups of like-minded people, that have a common agenda, which they seek to pursue. Here, in the given article, we have discussed the entire topic and their differences in detail, so have a look. Meaning Political Science refers to the branch of knowledge that studies all the aspects of state and power. Politics implies an activity related to state and power. What is it? It is a part of social science. It is a social activity. Deals with Both empirical facts and normative issues. Problems of the citizens by interacting them politically. Actors Political scientist, scholars and academics. Politicians, lobbyist and administrators. Objective To understand different political patterns and to provide such a framework which expresses reality. To initiate public welfare and improve their conditions by implementing constructive policies. The term political science refers to that branch of social science which is analogous to the foundation of state and system of government. It discusses country and its economy, considering various time spans, i.e. past, present and future. The political science emphasizes the theory and practice of the government as well as it thoroughly and systematically analyzes the political systems, institutions, processes, functions, activities and behaviour. Further, it also evaluates public policies and governments. Political Science is divided into five disciplines that cover a range of advanced political economy. These are the political theory, comparative politics, public law, public administration and international relations. It is useful to understand the way in which governments operate, allocation of power and resources, impact of the policies laid down by the government in the economic stability. The term politics may refer to all those activities that are concerned with the administration of the country. In finer terms, politics implies a process wherein the political leaders and the party tries to achieve their goals, which may be contradicting with another political party. It is directly analogous to conflict and conciliation, that leads to rule of order and justice in the society. The primary aim of politics is to improve the standard of living of the area and initiate development activities, by means of various schemes and programmes run by the government. It tends to create, preserve or amend new rules, under which the citizen lives. Practical politics includes all the real world happenings, such as the formation of the government and its working, formulation of laws and policies. Further, international politics is also a part of practical politics which includes affairs like peace and war, economic order, protection of rights, among others. It is also referred as a ‘dirty game’ by the common man. Political Science is a subset of social science that studies politics and government and is also concerned with description and analysis of political behaviour, issues, system and activities. Politics is the study of government structures, organizations, operations and activities and identifies the possibilities to use or achieve power. Political science talks about the state, its working, functions and distribution of power and resources. On the other hand, politics is a social activity, as it involves dialogue between political parties, due to their disagreement regarding different matters. Political science is concerned with factual statements and also determines the existing political practices and organizations and concentrates on the ways to improve them. Conversely, politics deals with the problems of the citizens of the country and seeks to obtain power in order to resolve those problems and improve their living standards. The main actors in case of political science are a Political scientist, scholars and academics. In contrast, politicians, lobbyists and administrators are the actors in case of politics. The basic objective of political science is to know various political patterns and to provide a substructure which expresses reality. As against, politics aims at initiating public welfare and raising the standard of living of the citizens by implementing constructive policies. 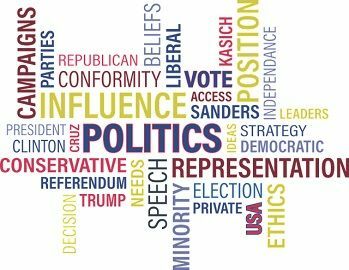 The term political science and politics are closely related to one another in the sense that the latter is the subject matter of the former as well as the political science helps to understand, the politics in a better sense. The main difference between these two terms is that politics implies practical politics, i.e. that happens in the real world situation like formation, working of government and laws. On the other hand, political science has a theoretical approach.